Could Martin Talbot's elderly, Alzheimer-stricken mother, Judy, really have been the Black Stiletto? When Martin discovers several volumes of her diaries hidden by his mother, he is stunned beyond all imagination. His mother, the underground heroine of yesteryear? The famed, still unidentified woman who battled Communist spies, took on the Mafia, and preyed on common crooks? The woman who exacted punishment on evildoers without mercy? But it is all described, in great detail, in the diaries. What caused her to begin her quest for justice. Her decision to act outside the law. Her feats as the famed and feared vigilante. How her reputation exploded. In short, how it all played out. Could it be true? Talbot is filled with doubt and disbelief. But the reappearance of one of the Stiletto's old enemies with a thirst for merciless revenge makes the story more than real, and could imperil the life of not only the Stiletto, but her son and granddaughter as well. Enjoyed the story, good narration and interesting plot. I would consider this a young adult novel. I received this audiobook free in exchange for an honest review. Watch out for the Black Stiletto! 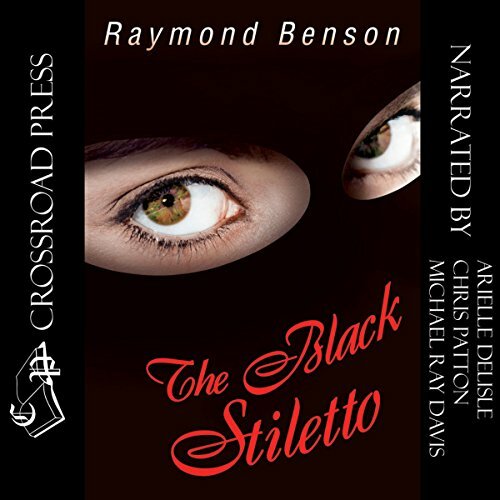 Where does The Black Stiletto rank among all the audiobooks you’ve listened to so far? I enjoyed it immensely and would recommend it to any one who likes a good action story with a strong female heroine. I liked Judy Cooper and seeing her develop as the Black Stiletto. It was satisfying to see her get revenge on men who had wronged her. The Black Stiletto getting naked in her effort to combat Communism. The revenge scene with her stepfather was very satisfying. This story was truly enhanced by being narrated by three different readers. I don't think my experience would have been so enjoyable on the printed page. Arielle DeLisle gave Judy Cooper's voice energy and authenticity. I would like to hear more of her and I'm looking to forward to the next in the series. Chris Patton did a good job with the voice of Martin but for some reason his part wasn't edited as well as the rest. There was a couple of instances of a repeated line - sort of like a stutter. Michael Ray Davis was my favorite of all the voices. His performance of Roberto Renelli, a gangster who has been in prison for over 50 years, was flawless and totally believable. He truly sounded like a 72-year-old, broken down gangster. I'm adding him to my list of favorite narrators. Raymond Benson came up with an interesting idea. I remember years and years ago when in training, working with some Alzheimer patient wondering what their life had been like and what secret were also lost to the disease. Benson has Martin Talbot's mother Judy Cooper Talbot in a facility for Alzheimer, he is asked to see his Mother's attorney. The attorney gives him a box and letter and said his Mother had instructed him to give this to Martin when she dies or is incapacitated. He finds a diagram to the house marking a secret room. In it he finds a costume and diaries, weapons. The story goes from Martin reading the diaries learning about his Mother and to the present day with Roberto Renelli a Mafia gangster being released from Sing Sing after 52 years. He is out to find and kill the Black Stiletto, who put him in prison. The story goes from how this happened, with Martin reading the diaries, to the current day, this adds more suspense as Martin learns of his Mother's life as The Black Stiletto. I think this might make a good series, so shall order the next book in line. Lots of action, suspense and some humor along with interesting characters. This is a bit different idea and has so much potential for a good story line. Arielle DeLisle, Chris Patton, Michael ray Davis did a great job with the narration. It reminds me of a good detective book based in the 1940's. A story written by a son that finds his mothers diaries and finds out that she was a super hero in her youth. it tells tales of her adventures as the black stilletto. Great realistic stories telling of how she got around the city and got justice for many. I was provided this audio book at no charge by the author of this book in exchange for an unbiased review. What did you love best about The Black Stiletto? I have never listened to an audio book with more than one narrator, this was very enjoyable. I really liked the narrator who gave life to the main character, the Black Stiletto. I'm not sure I would say edge of seat, but most surely kept my interest and attention. I liked the narrator who voiced the Black Stiletto, occasionally a southern accent seemed to creep into her voice, loved the natural way she worked. I don't want to read/listen to any book all in one sitting, to me there is no enjoyment to a book you rush through. Great story makes you feel like you are in that era.. The narrators couldn't have been better it was if the story was made for them. Glad Judy got the bad guy in the end even though she has Alzheimer just proves you may loose your mind but you will never loose your instinct. As a superhero style book, it ranks pretty good on my list. I liked the whole ordinary person with no superpowers take up the mantle to fight crime and to make it a female lead role was pretty cool. OMG!I could not put it down! I carried my cell phone and was plugged into the headphones when I wasn't in the car. it's been a long time since I listened like that. I am going to look for more of the series. The story was fantastic and with the 3 narrators was just riveting. WOW! This book is a keeper. It is well written, action packed, poignant, tragic, joyful, sad, hopeful, but most of all fun to listen to and/or read. It is the story of a man whose mother is in a nursing home suffering from Alzheimer. He is given a box his mother left him that was not to be delivered until she was permanently mentally disabled or dead. This leads to the discovery that his caring, nurturing mother had a secret past as the crime fighting Black Stiletto and the tribulations and hope that lead her to this path. The multiple voices of DeLisle, Patton & Davis work brilliantly together to enrich the listening experience and truly make this story leap off the pages. I can't wait for the next episode of "The Black Stiletto". This audiobook was provided at no cost in exchange for an unbiased review courtesy of Audiobook Blast. I loved loved loved this book! What made the experience of listening to The Black Stiletto the most enjoyable? The narrators of course. They brought to life all the personalities in this story. I loved how Judy went against the "Norm" in the 1950's to follow her own path. Just because she was a woman that didn't stop her from learning to box, and martial arts. It was unheard of back in those days for a woman to do any of thish. No, this is the first time so I have nothing to compare to. I look forward to the additional stories to come to answer the questions left from this book, like who is the father of Judy's son? How did Judy get the money to never have to work again? Will her grand daughter similarly follow in her grand mothers foot steps since she has qualities like Judy.